Spring is in the air and with spring comes the first major holidays of the year: Easter and Passover. There’s no reason to stress, though. Set guidelines for yourself. You’ll be amazed at how these simple rules can change your entire holiday experience—for the better! • Don’t worry about making the holiday perfect. No one is as critical as you are. • Decide what traditions are important to you and forego the rest. Figure out how to make the holiday meaningful for your family. Your family takes their cue from you, and no one will enjoy the holiday if you feel stressed. • Delegate whatever you can. When a guest asks what they can bring, have a suggestion ready. Be proactive about asking guests and family members to help. • Do it the same way every year. If you always serve the same dishes, use the same platters, and set up the same way, it becomes routine. • If you’re a family that takes turns hosting holidays, avoid Passover like one of the 10 plagues. Between all the different courses and types of food, this is a holiday meal that’s very labor intensive to host. • Although I always advocate ease and simplicity, the Easter baskets I see are filled with junk you don’t want in your house. Consider filling your own baskets with some higher quality toys that might last longer than an Easter egg hunt. • Store holiday accessories in labeled boxes with lids. Since these items are used only once a year, they don’t need to be accessible. 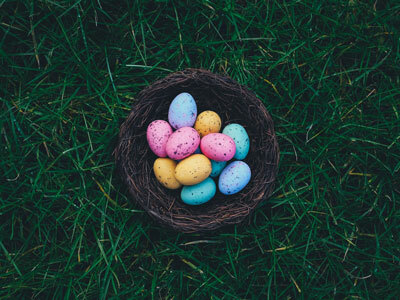 • If you buy Easter baskets without the handle, they’re easier to store and may have some other uses after the holiday is done. • Stock up for next year as soon as the holiday ends; that’s when you’ll find the best sales.